Social Media Marketing, Virtual Marketing Assistance By The Hour, Online Reputation Management, Small Business Marketing Consulting. 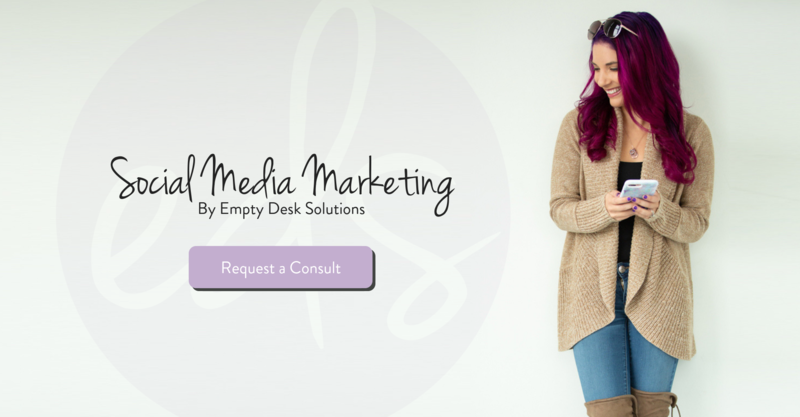 At Empty Desk Solutions, we take the hassle out of your social media marketing. Are you tired of trying to figure out what to post, when to post it, and where to post it to? We create custom solutions for each and every client we work with. We can help you with any marketing task big or small from graphic design, to blog writing, to marketing research, to email marketing! Use us when you need us, and we will only invoice you for hours used. No retainers here! Need a new website or just a little refresh? We are experts in crafting websites that will make your small business sparkle. Whats that? No content? No problem! We can help you write your website content while we do the design work – win win! Just here for some free stuff? Subscribe to our weekly marketing tip series! 1-2-3 SEND ME THE TIPS!